Confessions up front: I didn’t get to see the Wave. We did not get a permit. What is the Wave, you may ask? Well, go check out this link and then come back here. Don’t worry, I’ll wait. Access to the Wave is governed by a lottery process, with only twenty visitors allowed per day. Ten are assigned via a lottery several months in advance, and ten are distributed via lottery the day prior to the permitted date. The advance lottery process is described clearly and in great detail here. The in-person lottery is a bit more mysterious so I thought I’d describe my experience for those planning on trying for one. So how does the Walk-In lottery process for The Wave work? In general I’ll say that it is handled quite well by cheerful and friendly volunteers. The atmosphere was nervous but fun as people waited around for the drawing. The drawing is at 9 am MST (DST in summer) and they open the office doors at 8:30. It doesn’t matter when you arrive – everyone who is there before the 9 am drawing has the same chance. Pay attention to the time zone issues with Northern Arizona and Southern Utah – there are always people who show up an hour late. The permits are currently issued through the Grand Staircase-Escalante National Monument Visitor Center in Kanab, Utah. When we did it we had to go to the Paria Contact Station. I believe the location is based on time of year. Make sure you double check. Due to the small size of the office they asked that a single representative for each group come in while everyone else waited outside. Each representative filled out a form listing the number of people and the names of the people in their group. If more than one person from a group filled out a form both would be disqualified – one chance per group. As the volunteers collected the forms they checked through the other forms for name duplicates. There is no benefit for people who have showed up multiple days in a row. Somewhere I read that you got an extra chance per day you’d showed up but that was not (or no longer) the case when we were there. In fact, as we stood around we chatted with a guy who was on his 5th day of trying for a permit. At 9 am sharp they stopped accepting applications. Each form was numbered at the top. I believe there were 16 groups totaling around 45 people. The volunteers said this was a very low number (probably due to the weather). In fact, on the door they had a list of the previous month’s daily lottery entries and the numbers were closer to 70 people per day. They took out a bingo wheel and a box of bingo balls with numbers on them. They put the balls numbered 1-16 in the wheel and drew them. In order to assign the permits they would match the number on the ball to a numbered application. So, if the first one drawn was an application for two people, they would get two permits and they would draw again for the remaining 8. If the next group was four, they would draw again for the final four. If they then drew a group of six, the group would have an option of taking the four and having to leave two people behind, or passing entirely. The process went on until the ten spots were filled. The Wave permits are clearly in huge demand. There are some simple changes I believe they could make to leave fewer people frustrated and make sure the permits are being issued to people who will actually use them. The big complaint I have about the way that permits are handled all boil down to one thing: there is no common sense applied. They know that there are significantly more people who want to visit than they can accommodate, but their process does not maximize the chances that people they give permits to will actually get to see the Wave. First, the half of the permits that are pre-determined by lottery are just mailed out, never to be seen again. For all they know, none of the 10 people actually showed up that day. And they have people requesting them from all over the world, trying for anything. How many of them get the permit and then actually arrange to travel there? Meanwhile they have a room full of people standing RIGHT THERE who desperately want to go. I would suggest that if you get one of the advance lottery permits that you be required to pick it up in person ahead of time or forfeit your spot. Yes, it is inconvenient to have to pick up a permit, but I’ve done it a 100 times with minimal inconvenience. If you don’t pick it up by a certain time it can go into the pool for the people who are there that day. Second, we were there during horrible weather. While collecting the applications the volunteers clearly said many, many times that the road was impassible to all but the most capable 4WD drivers and vehicles (even then, incoming storms were making things worse). However, that didn’t deter anyone from entering the lottery, that’s for sure. Sure enough, as the permit spots filled and I watched the permit winners get into their cars, they were all small rental sedans from Las Vegas – a Ford Focus, a Nissan Altima, etc. So great, they got the permit, but there was no way for them to actually get to the Wave. They were told by the volunteers: you will not get in there. It’s hopeless. Meanwhile, the handful of us with vehicles most capable of negotiating the conditions were stuck with nothing. Most likely the Wave saw NO visitors that day. I’m glad I experienced the process so that I know what to expect. I’m disappointed that we didn’t get a permit, especially considering that the people who did get them that day probably didn’t even use them. The weather really skunked us in this whole area and we didn’t get to see much of anything. But what we did visit was incredible. Although the Wave is the big famous focal point of the area, don’t let tunnel vision take hold. There are miles and miles of unique scenery to explore in the area. I cannot wait to go back and visit in good weather. Even if we don’t get a permit for the Wave again, I know I could stay busy for weeks. I am trying to get this permit for 2 years in row, but no luck. After reading your article, I agree 100% with you that people should pick the ticket in person a day ahead, if they fail to pick it up on the certain time, then their tickets should go into the pool for the people who are there that day, it would not waste the very valuable tickets for that day. totaly agree with you guys, expecially for on line lottery and no show burned permits.funny thing that I read if you wanna cancel your on line permit you have to send back a MAIL by post with documents inside!! sure, I wonder that a tourist from Azerbaijan switching idea on his travel goes to buy a stamp to send a letter to Utah. Pick up is a solution,maybe the best, but they could also put an easy box at wire parking to confirm your presence, or you get 100/200 $ fine.they got your credit card details…. Now I told my story, I’m from Italy, and I started to think to a travel of southwest in early december for end of april.After booking my plane ticket on january I began to draw my trip. 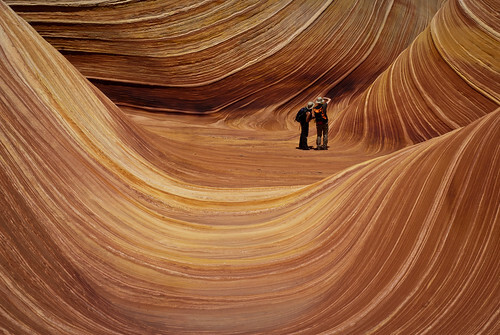 I’ve seen some pictures of “the wave” and coyote buttes area and i was impressed.than i realized everything about permit and lottery so no chance even to partecipate, too late in February for April. I’ll be there only 18 days, many things to see, and i couldn’t plan all my all holiday just to be in Kanab 2/3 days to attempt a lottery with odds of 10%.Crazy. I think release 20 permits per days is quite stupid.Ok is a “fragile area”, I respect it, but i’ve tried to search what is so sensiteve…..no answer.and why 0,5 miles from coyote borders is a free area? 20 paces up nature rules change? And i also think that a silly person could do more damage than 20 people together. Don’t know, it just seem to me a tricky to stuck people in Kanab and fill the comunity hotels and restaurants. How about 20 silly people. The reason only 20 permits are allowed per day is in years past hundreds of people would traipse through these areas. The damage is done by so many feet tramping the fragile sandstone. It is not like granite, it erodes faster than the harder rock geology. Please understand that the US is very serious about all its public lands, the southwest more than other places. Do not wear it down faster than nature can. The reasons for the limit is well documented on several websites along with the BLM site. I wasn’t lucky enough to get a permit to the Wave this year, but I have a permit for the South Coyote Buttes. Same limitations. It’s not stupid, it is protection for future generations. I came across this blog by accident and read the comments to this post. The latter one I could not leave without a remark. I’d like to say upfront that I have been to the Wave twice, each time I got the permit at the walk-in lottery (the second time I had to leave my wife behind in the motel, as we only got a permit for one person). Giving away permits is absolutely the best approach for this area. Kevin asked what is so fragile – well, the entire sandstone. When you walk within the Wave it can easily happen that a bit of sandstones comes loose when you step on it the wrong way. I have seen it happen. People who have never been out there should not comment on whether the area is fragile or not. Making this accessible to all without limitations would be a total mess. Just imagine tour buses going there, the place would b e ruined in less than a year. And given that it is so popular, I am sure that is what would happen. So you can argue about the number of permits and the process. I must admit that I can live with both (for instance, if you force people to pick up their permits, you make it more inconvenient for them just to make it better for the people walking in – not everyone can afford arriving a day earlier just to pick up a permit) and I think it is a fair compromise of giving out permits for advance planning and adhoc visits. The one thing they should improve is catching people violating rules. For instance, I have met groups out there that told me they had submitted several online applications under fake names. And how difficult is it to come up with fake names during the walk-in lottery? Unfortunately people don’t play fair all the time. Go in the off season (in November I had 14 people showing up for the lottery) and enjoy the silence of the place if you win. Then you’ll understand why the system makes sense. Finally: remember that the system is in place to protect the environment, not make it convenient for tourists. And they are doing a good job in that regard. It’s still better than prohibiting access entirely. Very accurate description of the walk-in lottery process. I was lucky enough to get issued one last December. Some people have rental sedans, but they hire a “guide company”, mostly just to drive them in. The road is indeed awful, and gets worse later in the day when the snow melts. The asphalt highway descent clearance 4WD vehicle I used made it, but it was a tense drive out. Sometimes my steering wheel would be jerked 180 degrees but the car would be going straight (no purchase in the front wheels). Pray the vehicle doesn’t take you into the ditch. No control over direction. Memorable, but not something I’d want to do again. Alternatively one can try some luck by using the alternate southern portion of House Rock Valley Road to 89A. I counted more than 20 people at the destination. At first I thought some snuck in, but later came to the conclusion they were guides and guides did not need to enter the lottery and are not part of the 20 limit. So I suppose the Feds are getting a share of this revenue? As they should. The permit fees are very minimal. I would like to see some kind of waiting list used. I have tried for YEARS to get a permit through the lottery b/c I live on the eastern side of the US. It’s all chance and luck and I haven’t gotten it, although I know people who have been there more than once. It’s very frustrating. I think this lottery business is a ridiculous system. Its a cash grab for those who enter online… $5 not refundable. Why not just make 20 tickets available and sell them either over the phone or online. Why all this lottery crap. If its money they are looking for, just raise the price. The whole point of this permit system is to reduce the number of visitors into the Wave, thus to preserve it. Having that in mind, the current lottery system with many unused permits is doing a great job! For the really determined minds, try it every month online, it’s small chance but it will happen in a year or two.